Néstor Fabián Pitana (Spanish pronunciation: [ˈnestoɾ piˈtana]; born 17 June 1975) is an Argentine football referee and former actor who refereed at the 2014 FIFA World Cup, 2015 Copa América and 2018 FIFA World Cup. He oversaw the opening match of the 2018 FIFA World Cup between Russia and Saudi Arabia. Pitana was appointed to take charge of the 2018 FIFA World Cup Final between France and Croatia at Moscow on 15 July 2018. 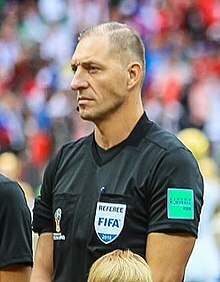 He became the second Argentine referee to take charge of a World Cup Final (after Horacio Elizondo, who did the same in 2006). Pitana's performance in the 2018 FIFA World Cup Final has seen some controversy, mostly related to the use of Video Assistant Referee (VAR) technology. France's first goal was scored from a free kick which was seen by many as a dive from Antoine Griezmann (however, the rules at the time related to VAR forbade intervention in the case). France's second goal was scored from a penalty given after Pitana was informed by VAR that he may wish to review the recording of Ivan Perišić's handball. After a lengthy deliberation and indecisiveness, Pitana awarded the penalty to France, which many pundits called an incorrect interpretation of the rules, which steered the game into France's favor. ^ "Nestor Pitana to referee the Opening Match of 2018 FIFA World Cup Russia". FIFA.com. 12 June 2018. Retrieved 14 June 2018. ^ "Nestor Pitana to referee World Cup Final". FIFA.com. 12 July 2018. Retrieved 12 July 2018. ^ a b Menzas, Jack (15 July 2018). "World Cup final referee in VAR penalty controversy". The Independent. Retrieved 1 December 2018. ^ Hackett, Keith (15 July 2018). "Decisions in the World Cup final showed, again, VAR's fatal flaw: the on-field referee making the final decision". The Telegraph. ISSN 0307-1235. Retrieved 1 December 2018. ^ Homewood, Brian (15 July 2018). "Pitana's path from film extra to World Cup final referee". Reuters. Retrieved 1 December 2018. ^ "FIFA must rethink the handball rule: Osvaldo Ardiles - Times of India". The Times of India. 15 July 2018. Retrieved 1 December 2018. ^ Soidri, Abdallah (15 July 2018). "L'arbitre de la finale de la Coupe du Monde raconte sa décision de siffler pénalty pour les Bleus". Football Stories (in French). Retrieved 1 December 2018. ^ Clattenburg, Mark (15 July 2018). "Mark Clattenburg: World Cup final referee got penalty call wrong". ISSN 0140-0460. Retrieved 1 December 2018. ^ "World Cup 2018: Nestor Pitana's worst day... which saw him suspended". MARCA in English. 15 July 2018. Retrieved 1 December 2018. ^ Wahl, Grant (15 July 2018). "France wins World Cup–with an assist from VAR". SI.com. Retrieved 1 December 2018. ^ "Former refs disagree on France penalty". The New Paper. 17 July 2018. Retrieved 1 December 2018. ^ Johnson, Simon (15 July 2018). "Referee killed Croatia's World Cup dream, says Luka Modric". Evening Standard. Retrieved 1 December 2018. ^ "Argentina's Nestor Pitana to referee FIFA World Cup final". The New Indian Express. 15 July 2018. Retrieved 1 December 2018. ^ Baxter, Kevin (15 July 2018). "Croatia's tank far from dry after three extra-time wins". latimes.com. Retrieved 1 December 2018. ^ "Néstor Pitana: matches as referee". worldfootball.net. Retrieved 14 August 2018. This biographical article related to Argentine football is a stub. You can help Wikipedia by expanding it. This page was last edited on 7 March 2019, at 12:33 (UTC).